When you’re looking for high quality and professional coats for doctors, Alsico delivers. From the fit to the fabric to the little details, everything about our doctors coat range says quality, durability and professionalism. The doctors coat marks out those who wear it as leaders in their field, but it has other valuable functions. Our range of coats for doctors and for use in the lab are supremely comfortable, with great attention paid to fit and shaping for the ultimate in day-long wear. 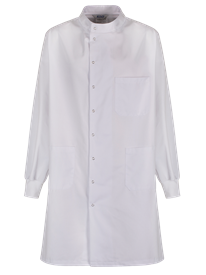 Made from the best technical fabrics available, your lab coat is breathable and will keep you cool even when you’re under pressure. 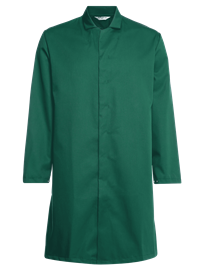 Our unisex Alsico coats for doctors are designed to project an air of confidence and style and will look good day after day. Not only does a lab coat serve as an easy badge of identity, but it serves to protect your clothes from everything from everyday spills to chemicals and other fluids. 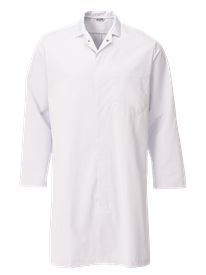 Our Alsico lab coats can be processed through an industrial wash to come up looking fresh, clean and hygienic every time. Our well designed and manufactured lab coat is easy to customise with your choice of embroidery. There are obvious benefits for your practice - you can add your name, place of work and specialism, for example, making you a walking ambassador and giving your patients the confidence that they’re seeing the right specialist in the right environment. You’ll build trust with your patients and be instantly identifiable whatever the environment you’re working in. Whether you’re working in a lab or on a hospital ward, it’s essential that your doctors coat offers protection and prevents the spread of contamination from work to home. 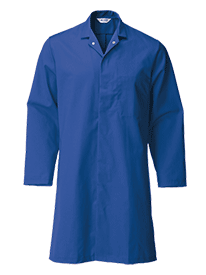 The Alsico chem splash lab coat has long sleeves with knitted cuffs to protect the wrists and arms and the special polyester/cotton blend fabric is tested to BS EN 13034 for chemical resistant materials. With a unisex fit, it’s ideal for day long wear in the lab, while the exposed stud fastening makes it easy to remove in a hurry. We can also provide anti-static coats, suitable for your specialism. 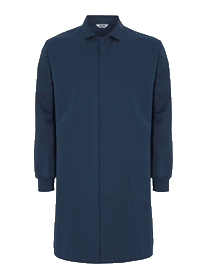 According to health & safety guidance, a good doctors coat should feature long sleeves with gathered wrists to prevent cross contamination and exposure of the arms. It should have a snap fastening for quick removal in the event of a hazardous spill and be composed of materials that are appropriate to the task. White coats for doctors will be composed of a suitable poly/cotton for general lab and ward work. 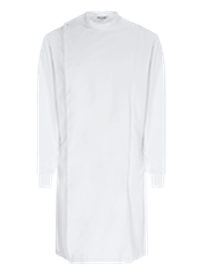 Our Alsico lab coat conforms to all specifications and features a generous longer length to protect the legs. 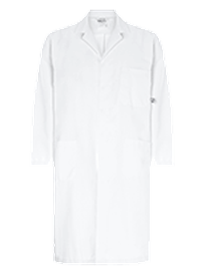 Manufactured from high quality technical fabrics, this cost-effective lab coat is the choice of professionals. Alsico is one of the largest workwear producers in Europe, supplying over 3.5 million garments yearly to the UK. With robust supply chains and our 70,000 square ft manufacturing facility in Preston, we can meet your needs quickly and efficiently. With both large stock ranges, like our benchmark high quality Alsico range, plus bespoke designs with no minimum order, we won’t let you down when you need world class workwear.